﻿Former President Obama has been conducting secret meetings with at least nine prospective Democratic presidential candidates for 2020 - including Bernie Sanders, Joe Biden, Elizabeth Warren and Deval Patrick, at his personal office on the third floor of the World Wildlife Building in D.C.'s West End. In quietly arranged one-on-one meetings confirmed by Politico, Obama is "eager to be a sounding board and counselor" to the Democrats he thinks has the best chance of shaping the future of the Democratic party. In other words, drop the Russia thing and try to reconnect with your base. As we noted in March, several Democrats see the Trump-Russia investigation as a "running joke," and that Americans are worried about said "kitchen table issues" more than the spectre of Russian involvement in the 2016 US election. Considering that the DNC is in shambles - having lost its last CEO in January after just eight months on the job, losing millennial voters at a record pace, and suffering a massive cash crunch amid the loss of a major donor - one can see why Obama is trying to triage the situation. Obama's meeting with Elizabeth Warren was their second since he left office, according to Politico - while the first was held in the spring of 2017 when Warren said she was "troubled" by the $400,000 Obama had received to speak at a Wall Street investment firm - calling the arrangement an example of the "snake that slithers through Washington." They apparently heard each other out and that was about it. Obama's in-person meeting with his old pal and Vice President Joe Biden was merely a formality, as the two are said to "remain personally close and speak by phone." Biden is apparently waiting until after midterms to make a decision on 2020, "though many people see him as leaning towards it," Politico reports. If the former VP does decide to run, prepare for endless compilations of him glad-handling people who are utterly creeped out by his advances. 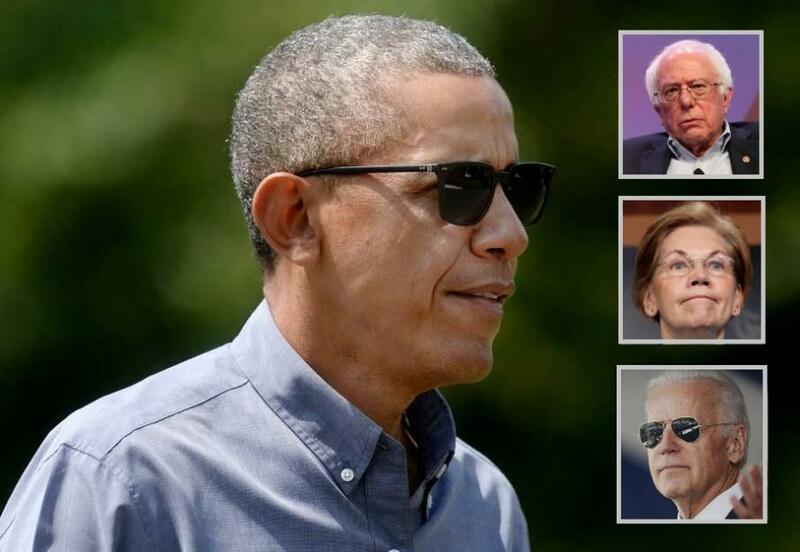 Obama's involvement with the 2020 prospectives comes after calls from major Democrat donors to take on a bigger public role in the fight against Trump. While the former president hasn't directly done so - perhaps due to the overwhelming evidence emerging that he was involved in the FBI/DOJ's espionage efforts on the Trump campaign - Obama has been privately urging donors to kick in fresh funds to the Democratic National Committee. Politico also reports that lesser known Democratic politicians have been coordinating with Obama, such as former New Orleans mayor Mitch Landrieu and Jason Kander - the filed 2016 Missouri Senate candidate who is considering his own run for the White House. We note that the words "Hillary" and "Clinton" are nowhere to be found in Politico's coverage. Perhaps those meetings are just super secret, or maybe the Democrats are simply done with her.